Stepping off the plane onto Turkish soil felt like being transported to another world. Like hundreds of millions of travellers before me, I had come to see Istanbul, the gateway between Europe and the East. Istanbul, capital of the Ottoman Empire for almost 500 years, is still a major cultural site for Muslims and Christians, although tourism has declined from a 2014 height of 42 million visitors. When I arrived, in the middle of June’s presidential election, it was against a backdrop of economic instability; inflation was soaring, causing a devaluation of the Turkish Lira. I could feel the tension, even at the airport, where guards gripped their rifles tightly as they scanned the crowd for threats. Riding from the airport to my hotel in one of the city’s oldest district, I looked out over the skyline, littered by half-finished apartment buildings. Turkish President Recep Tayyip Erdoğan’s face was plastered on every inch of the city. Even the sky wasn’t safe from his growing authoritarianism; planes circled the city, each trailing an image of a hopeful Erğodan on its banner. It was clear the developers and economic elites supported his re-election, but I wondered about the millions of people who wouldn’t benefit financially and the waning legacy of Turkey’s democratic experiment. The taxi driver translated the posters on his cab for me, echoing the authoritarian mood; “Turkey needs a strong leader.” I wondered how a statement like that could be taken seriously. From 1994 to 2003, Erdoğan was mayor of Istanbul, and since then has been both prime minister and president – surviving a foundering economy and a failed coup d’etat in 2016. Once a strong NATO ally and a contender for the European Union, Turkey has become almost unrecognizable in a modern context. Although I wasn’t really here for a contemporary vision. My visit was the culmination of 27 years of yearning to see the city, raised on the stories of my father, an Orthodox Christian priest. 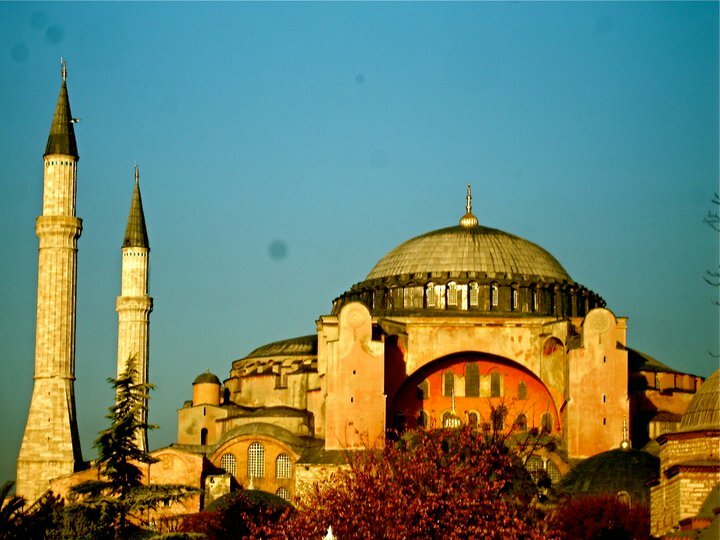 My bedtime stories included tales of the Hagia Sophia, the great church of what was then called Constantinople, one of the Byzantine empire’s enduring achievements. In the 10th century, Vladimir the Great sent emissaries around the world in search of a faith capable of uniting the clans of Kievan Rus’, the federation he’d conquered out of the lands that would become modern Belarus, Russia and Ukraine. 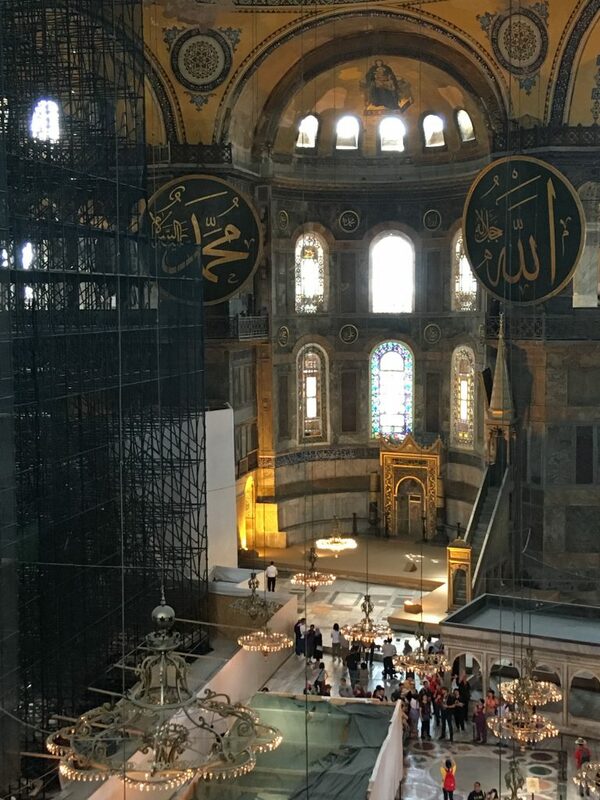 They found their faith at the Hagia Sophia, where the emissaries had a conversion experience while at an Eastern Orthodox service. As an atheist, I didn’t have the same experience, but the sheer grandeur of the 6th-century monument was deeply impactful. It’s changed over the centuries–serving as a Roman Catholic Cathedral, an Islamic mosque, and now a secular museum–but one can still see the graffiti left on pillars by the Vikings who helped Vladimir conquer his empire. I let my hands rest on one such inscription, and felt the weight of history; someone who had been alive over a thousand years before me had stood right where I was and left his mark. Istanbul is a walled city. In the 4th century, the Roman emperor Constantine moved the capital from Rome to Constantinople, which became Istanbul in 1923 when the nation shifted from a monarchy to a republic. Since the Romans, it’s been besieged by Latins, barbarian tribes, and the Seljuk Turks, who eventually morphed into the Ottoman empire. As a result, the old city is full of barricades and twisting alleys, each home fortified against its neighbor, bulwarks raised as if it were a small fortress. 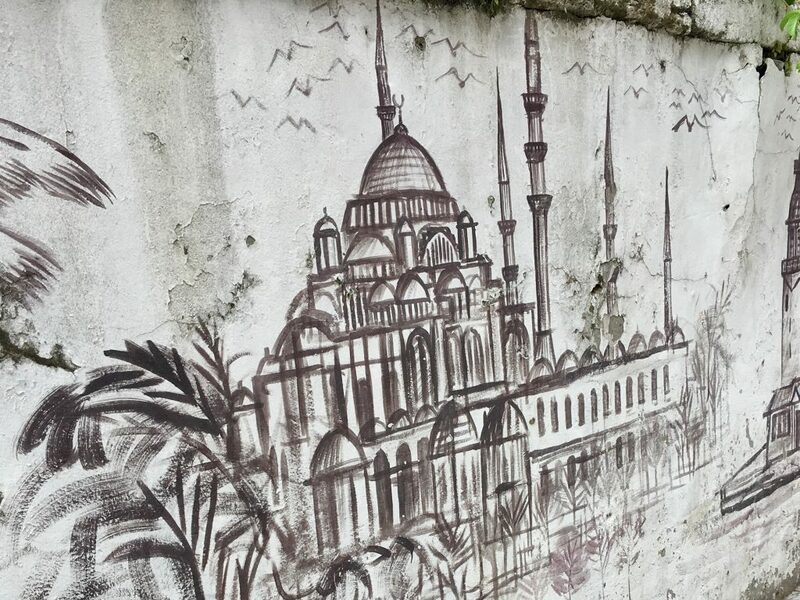 The graffiti in those alleys shared the voices of Turkey’s citizens over the centuries, enshrined in concrete slabs. In one neighborhood, I chuckled at the sight of a giant phallus painted onto a building; it was easy to imagine a drunken Ottoman soldier laughing at the hastily drawn phallus hundreds of years ago. Some things never change. One afternoon, my phone battery died. I made a wrong turn and quickly got lost. Soon, buildings gave way to half-finished developments, and it was obvious I was in the wrong place; I had drawn the attention of several Turkish men, who gestured at me as they spoke to each other. While not feeling directly threatened, I had a keen sense of how quickly things could change. A liquor kiosk near the men suggested one way out. I didn’t know if they drank, but I purchased a couple bottles of scotch, gambling that the language of spirits would quiet my nerves and theirs. The men appreciated the chance to sit down and have a drink with a tourist, a rarity in their neighborhood. They spoke a little English, and we sat and talked like travellers have for millennia. I told them about life in America and, of course, they shared their opinions about President Trump. In turn, I asked them how the Turkish economy had affected their families. They had worked hard after the 2001 economic crisis in Turkey to rebuild their savings, only to see the value cut down by further inflation. A bottle of scotch was a luxury for them; they appreciated the taste of cheap scotch in the same way Americans savor expensive whiskey. They joked, grimly: Things could always be worse, it could be Syria. This stoicism seemed to be the Turkish character on full display. Turkey is a nation surrounded by conflict, with borders along Iraq, Iran, Greece, and Armenia. Along the Iraqi border, the Turkish army is still fighting a low-grade insurgency against the Kurdistan workers militia, while the Greeks remain antagonists since 1453, when the Ottoman empire sacked Constantinople. On the Armenian side, there are still charges of genocide against Turkey, and northern Iraq remains an unsolved geo-political conundrum. Internally, Turkey is at strife, too. Islamic State recruits, drawn to the Syrian civil war, use the nation as a crossing point, and the Turkish government has cracked down on journalists; six weeks before I arrived, 24 journalists were arrested simply for asking questions. 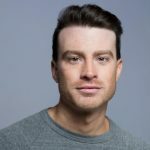 As an American abroad in 2018, I found the experience to be invaluable. I spoke with college students, Erğodan dissenters and supporters, business owners and workers. I was exposed to a way of life I could never have been privy to otherwise. In most cases, I was open about my background, and loved dispelling some illusions they held about Americans. 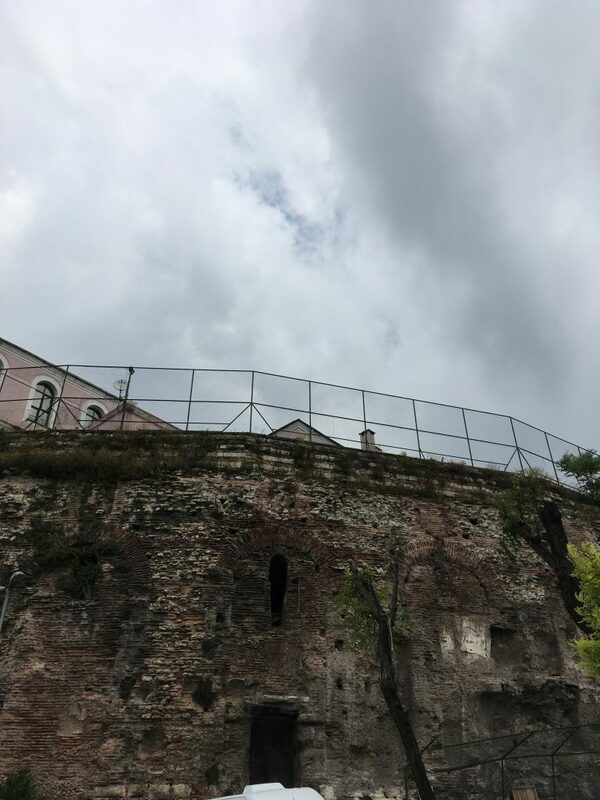 Istanbul is a beautiful place, and to have breathed the same air and walked down the same streets which produced some of the greatest philosophical and theological works the world has ever known was as powerful as it was life-changing. Constantinople was home to the first hospital and the first healthcare system for its citizens; it was at the moral and technical forefront of its age. Seeing its present culture, neither western nor eastern, but distinct, with its own rules and norms, was fascinating. The Islamic State considers the west to be the surviving Roman Empire, something that they are sworn to defeat. Yet places like Istanbul prove that both east and west can make a home together. *Photos Jack Clark. Cover photo Landon Shroder.